Hey Australia! Win Tickets to See MASTER Z and AIRPOCALYPSE in Cinemas! 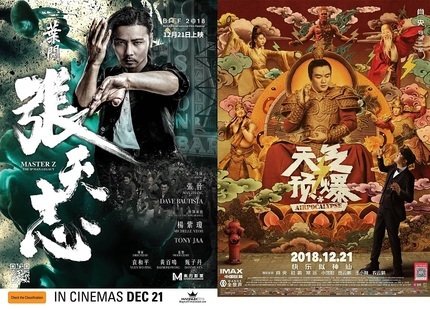 To celebrate the Festive Season, Magnum Films and Screen Anarchy are giving you the chance to win double passes for Max Zhang’s Ip Man spin-off film Master Z, in which he stars alongside Dave Bautista, Michelle Yeoh and Tony Jaa; as well as Xiao Yang’s comedy film Airpocalypse, which is about a psychologist known as the ‘Master of Suicide Intervention’. Each of our five lucky winners will receive double passes for both Master Z and Airpocalypse. This competition will close at 3pm on December 18. Good luck!